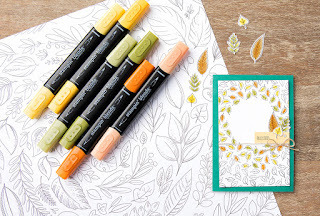 Tina's Creative Studio: Stampin' Blends are Here! How exciting! You can now order Stampin' Blends, our very own alcohol brush markers that coordinate with our colour range, and give gorgeous smooth results in your colouring projects. I like the fact that these are in Stampin' Up's colours, so will coordinate with our cardstock, designer series paper, embellishments and ribbons. The best ink for stamping outline images for the Stampin' Blends is Memento black ink. The markers are available individually as well, but to start off it's best to buy them in pairs or as the whole bundle, as I have done. There's also a cute stamp set and project kit that includes supplies to make 16 cards. If you'd like to order these, click on the images below to go to my online shop.